Aging in place (#agingingplace) is the ability to live in one’s own home safely, independently and comfortably regardless of age or ability. Most would rather remain in their own home, whether they may become disabled due to a car accident, or perhaps become less-abled due to problems that sometimes come with aging, such as poor eyesight, inability to reach those upper cabinets, or limited mobility. The good news is that manufacturers have recognized the need and are producing wonderful products that make a home much safer without causing it to look institutional. Designer grab bars, tiled roll-in showers and faucets with blade handles or touch-less are just some of the options available now. Some homeowners are becoming pro-active and during a bath renovation are including some of the options for accessibility. When researching for your next bath remodel, you might want to consider asking your potential contractor if he or she is CAPS certified (Certified Aging-in-Place Specialist), so they could help with suggestions to make the new bathroom more user friendly for a person with limited mobility. DyLon McClary, the president of Rose Construction Inc is a certified aging in place specialist. 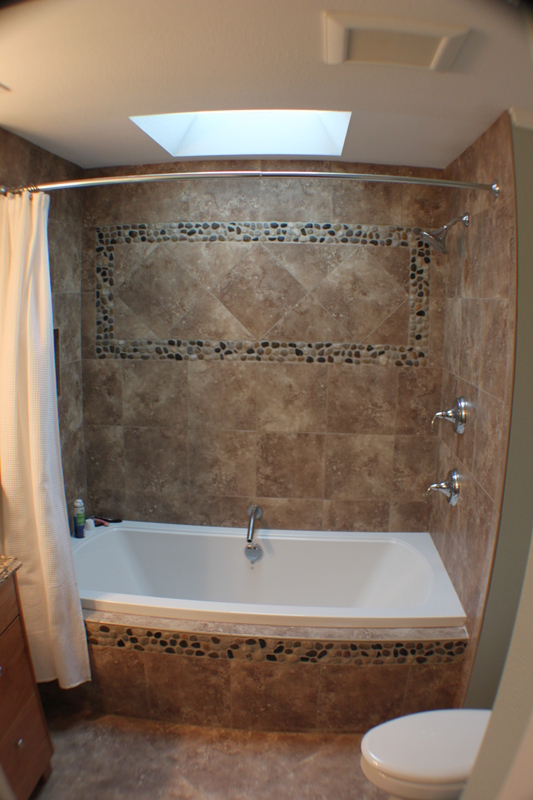 Give us a call the next time you are considering a bath remodel, and we would be happy to assist you with ideas for including greater accessibility in your new bathroom. “Scope of work” is the term used to describe the basic parameters of a project. You can start with your wish list and budget, then determine the scope of work. A designer, architect or contractor you like and trust can help develop your scope of work and help you to be realistic about what your budget can achieve. If you can keep the existing footprint and keep appliances in current locations, this will save a great of your budget. Relocating the sink or range means moving the plumbing or gas lines, which can be expensive. If you would like to open up the kitchen to another room, then you need to find out if that wall you want to remove is load-bearing. This might require structural work and unforeseen costs. Research appliances, paints, materials and finishes for your project; this will help your contractor understand your expectations. It might help to gather some photos of what you want. Then ask friends and relatives for referrals for contractors and check their references. 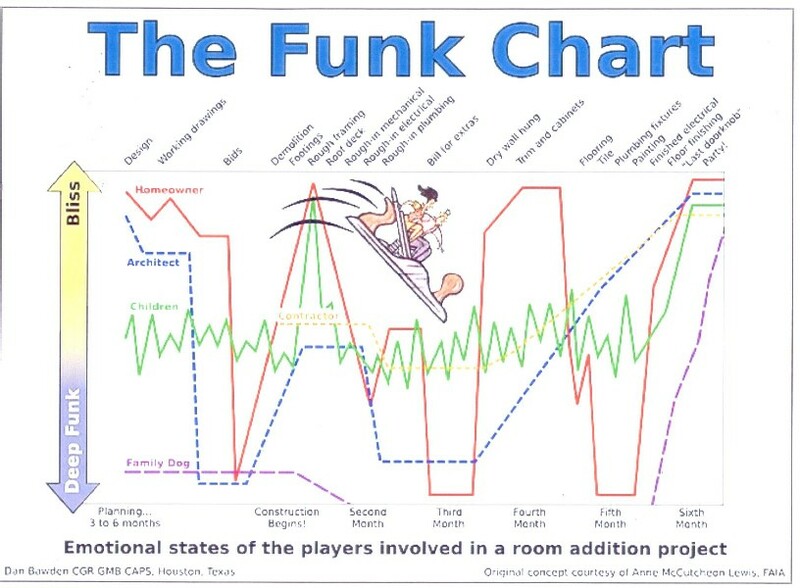 It will take some time to figure out who is the right fit for you. With new construction, you probably have heard prices referred to as the cost per square foot, but this formula rarely works with remodeling. Every home has unique conditions due to age, construction type and layout. In addition, it’s a good idea to work with an experienced contractor in arriving at the scope of work and cost estimate; a novice may underestimate or overshoot the budget by a wide range. It’s a good idea also, to have your basic square footage, layout, electrical, mechanical and lighting goals ready to help a contractor give you a more accurate estimate. Well, the worst of winter is over for our Pacific Northwest, and while the weather here is mild compared to the rest of the country, this winter we had a late snowstorm (6-8 inches), with serious wind. That means we are still cleaning up the smashed hedges and broken tree limbs. So, a nice new kitchen would be a real pick-me-up right about now! 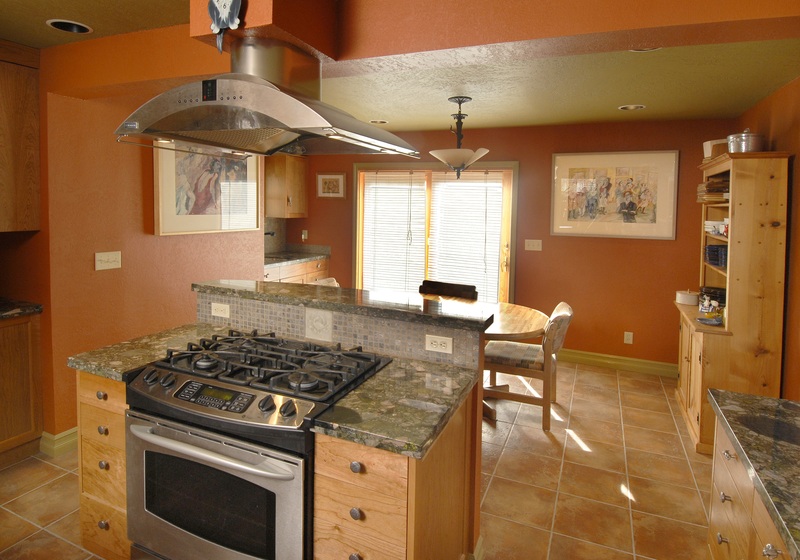 Be sure to consider the way your kitchen’s look will coordinate with the rest of your home. An ultra-modern kitchen in a 19th-century farmhouse will just look odd. 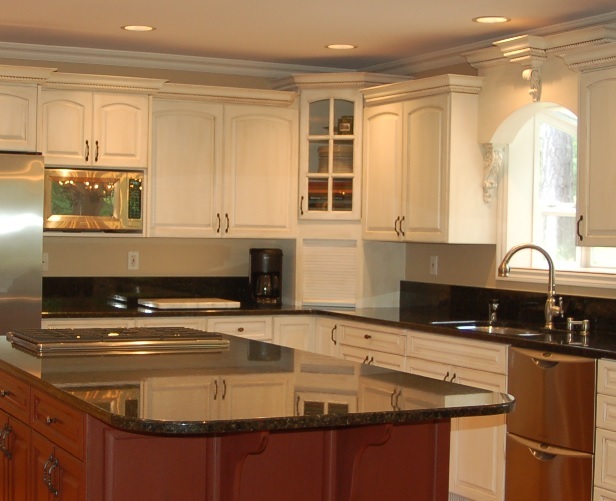 Be aware that selecting beautiful cabinets is only half the battle-and, in a lot of way. Make sure you have enough storage for all the plates and pots-and accessories like tray dividers and pull-out shelves that will make items easy to find. It would be wise to select conservative colors for cabinets. For the fun touch, choose unusual pulls, colorful countertop appliances and unique accessories, but select a cabinet that you-and your family-can live with for the next 15 years. And if resale is in your future, be sure to favor the sound choice over the exciting one. 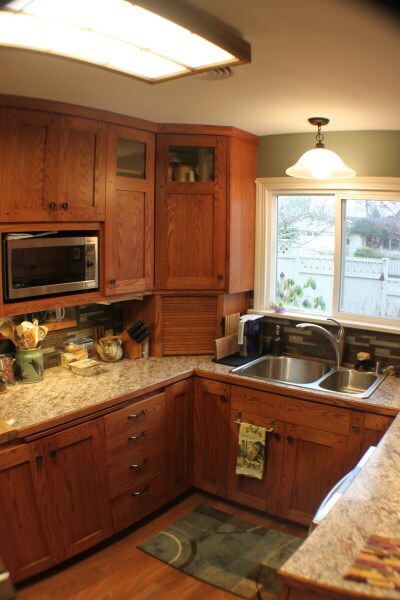 A kitchen remodel is a massive undertaking. Unless your daytime job is as a, say, general contractor, you may want to leave this one up to the pros. Assistance from kitchen designers, contractors and architects is invaluable, but be sure to partner with licensed and insured professionals you communicate well with. You might want to consider incorporating design for limited accessibility, as you may have friends or relatives that might need these options, or even yourself, if you plan to stay in your home as long as possible. Invest some time and money in a good lighting plan. It’ll keep your kitchen safe and allow you to set the appropriate mood. 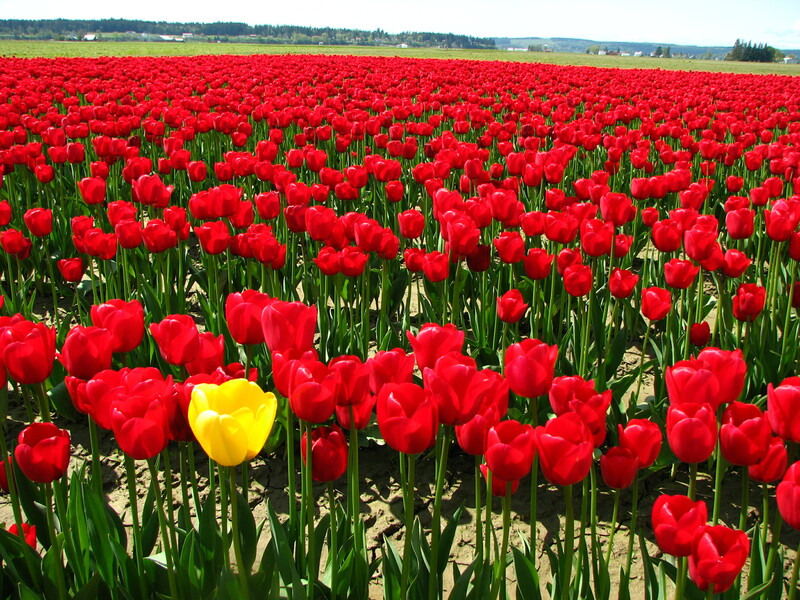 Be aware that any changes you make after the bid is complete will increase costs! A lot of planning should be done before the remodel begins, and if this is done well, your project will go smoothly. The first phase should be carried out by the homeowner; researching contractors and checking references. Go to your local NAHB website (www.nahb.org) and the BIAW (www.biaw.com), as well as the Labor and Industry website to check that a contractor’s licenses and insurance are up to date. Call references; this will give you a good picture of their quality of work and how easy they are to work with. That said, the obvious thing is, when the bathroom is being torn about and put back together, you won’t be able to use it. Hopefully you have another one in the house? Don’t forget to consider “Universal Design”, also called “Aging in Place” features to include in your remodel. You or your visitors may find the features handy, and they can increase the resale value of your home, as it will be accessible to more potential buyers when that day comes. So, how will the project affect you? It can be stressful, but the rewards will be worth it! If a bad accident, illness, or mobility issues due to aging should happen to you or a loved one, would you have to move out of your home? Most existing homes are not designed for mobility impaired persons. When contemplating a bathroom remodel, many are including UD or CAPS principles included in the design process. With modern materials and products this need not cause your bathroom to look like a hospital room! Far from it. A brief review online will impress you with all the stylish designs that are out there. Plenty of room for access and to maneuver a wheelchair. Not all mobility impaired persons will be using a wheelchair, but designing the room to accommodate one will meet or exceed any special needs. 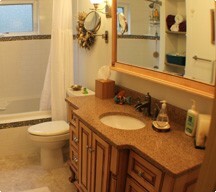 Provide for an open area within the bathroom that’s at least 5 feet in diameter to allow for easy turning. Also provide 4 feet of clear space in front of each fixture, as well as between the sink and the toilet, if both fixtures share the same wall. These spaces also will allow room for a caregiver, if needed. Doorways should be 3 feet wide, so a wheelchair can easily pass through. Select a vanity that is open underneath, so a person in a wheelchair can pull in. 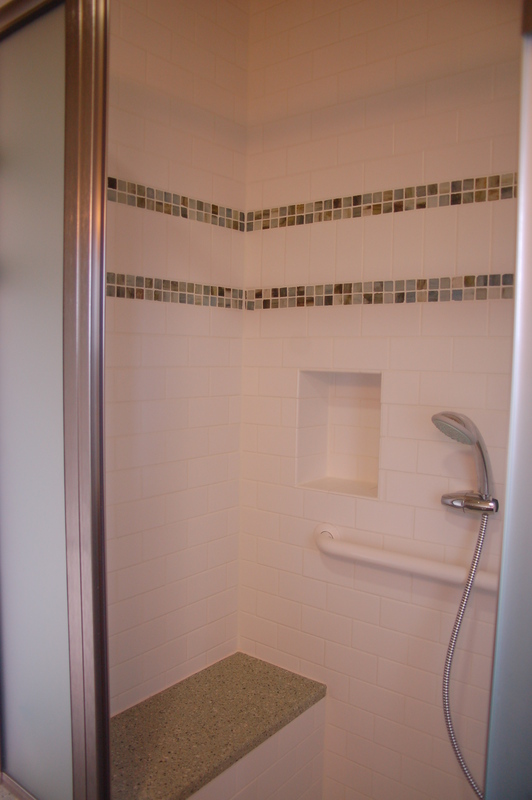 The shower should have no threshold so a wheelchair can enter. Control valves and shower heads should be at two different heights, or there should be a handheld nozzle. Provide grab bars and a built in seat. The toilet should be at ADA specified height, with grab bars for safety in rising and seating oneself. That is a good start! There are other things that should be considered, such as non-slippery flooring materials, adequate lighting, and faucets that are designed to prevent scalding. Of course, all light switches should be low enough so a person in a wheelchair can easing reach them. There are ADA approved faucet handles, or even touch-free units, as well as door knobs of the blade-type, that are easier to use than the standard round knobs. Not all of the possible handicapped accessible design concepts need to be included in every CAPS designed bathroom, only those that the owner feels would work for them. DyLon McClary, the owner of Rose Construction, is experienced and certified in CAPS design, and we would be happy to assist you with design and construction of your next bathroom remodel, incorporating the principles of Universal Design and Certified Aging in Place. Give us a call! 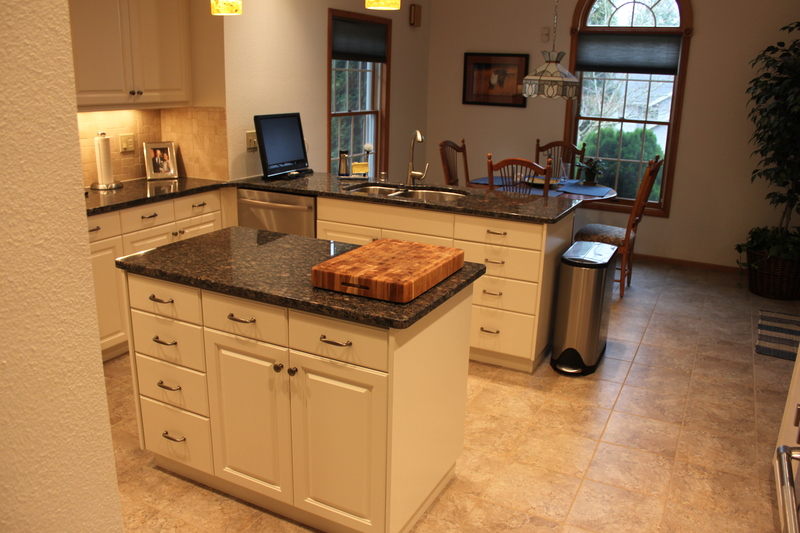 How to get more cooking, countertop and storage space! That’s what a kitchen island is for. When you decide you can’t do without one any longer, the first thing you must do is determine if you have room for one. That done, decide what features you want the island to have. For some, a fully functional kitchen island is a more appealing and convenience option, allowing them to do perform all kitchen tasks at the island. If you choose to incorporate a fully functional island in your kitchen, you’ll need to have gas, water and power piped to the island. With all those things in place, the kitchen island can feature a stove, sink, dishwasher, microwave, toaster, blender, coffee maker, refrigerator and any other cooking, cleaning and storage elements you can fit on and in it! Storage is often an important and challenging element of kitchen islands. Many of the larger ones feature both drawers and cabinets for storage. To make the storage efficient and “close-at-hand”, keep shelving and drawers shallow and narrow; you’ll avoid foodstuffs and supplies stacking up and migrating to the back, never to be seen again. Finally, consider adding some convenient or decorative elements to your kitchen, if you have the space. You can increase the storage space and efficiency of your kitchen by adding a lazy Susan or pull-out trashcan to the island. Kitchen island with gas stove!